There’s never been a dean of students quite like Frank Logan. It’s a little risky of me to write about somebody who I met but once or twice, but who a lot of people around Wofford knew very well. The stories about Frank Logan are plentiful, and most of them are probably even true. He was a character in the truest sense of the word. Samuel Francis Logan graduated from Wofford in 1941 and was a member of the first class of members in course of Phi Beta Kappa. After a few years away from Wofford and the completion of an MA in history at Duke, Frank Logan returned to Wofford as registrar and director of admissions in 1947. He remained at the college in various capacities until 1980. During his early years he taught in the history department as well. In 1956, President Pendleton Gaines named him dean of students, a position he held for thirteen years. It is for those years that he’s probably best remembered. Some of the best Logan stories are in a chapter of Dr. Will Willimon’s book Friends, Family, and Other Strange People. I doubt I could do any of them justice, but you should find the chapter. One of the best was when he ended the famous 1965 food riot at Wightman Hall with a few choice words in a police bullhorn. Frank Logan was dean of students in an era when the college still practiced in loco parentis, where the college acted as the parent for students. What that meant in practice was regular dorm inspections, mandatory chapel, no booze on campus, and generally a fairly regulated student disciplinary system. While there was a court of sorts, the real court was at the dean’s desk, and justice was quick and certain. There were some unwritten rules, one of which I like to quote occasionally, that being the “failure to profit” rule. Dean Logan would send someone home for failing to profit from the benefits of a Wofford education. It’s something nobody could get away with now, but there’s a certain logic when a student is clearly failing to avail himself of the opportunities that abound at the college. 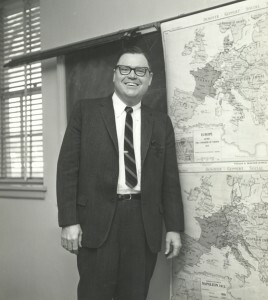 After his thirteen years as dean, Frank Logan moved to admissions, which he led for several years, and then to alumni affairs, which he led until his retirement in 1980. The Logans kept in contact with their many friends on campus and with hundreds of students who called themselves “Logan’s Boys” until his death in 1995.